When Is a Canine X-Ray Needed, and What Does It Involve? If you’re anything like me, your dog is your whole world. You’d never consider denying your dog the medical care he needed, even if it ended up costing you a lot of money. That said, some treatments for dogs cost a lot more than others, and a canine x-ray can be one of the most costly procedures. So when is a canine x-ray warranted? How much are you going to have to spend? Sometimes, there’s no such thing as just one canine x-ray. In Help, My Dog Ate a Battery, I told you about how my big sweet doofus, Leroy, chowed down on a D-cell. I was lucky; the only real worry was whether anything had lodged in his digestive tract, so it was just a matter of a single x-ray. A dog that has, say, been hit by a car might require several x-rays, and depending on where the injuries might have occurred, the cost of x-rays could be anywhere from $40 to $180 dollars each. That can end up being a pile of money. So, you have the problem, when your dog needs x-rays, not just of worrying about his health, but worrying if you need to take out a second mortgage because a canine x-ray costs so much. The thing is, too, it’s not always the cost of the canine x-ray that you have to think about. Depending on the condition of your dog, and the area that needs to be imaged, your dog might have to be sedated, and that means even more money. This is something else that could affect the cost of a canine x-ray. If you need to have an x-ray taken as a routine procedure at your veterinary clinic, it might come in on the low end of the scale. However, if you have an emergency, and need to take your dog to an animal hospital that specializes in emergencies, it could add up to twice as much. The size of your dog might also be a factor. This is because, if your dog needs to be sedated in order to be x-rayed, a bigger dog will require more sedation. A small dog might cost you, say, $40 in addition to the fee for the x-ray, but, if you have a large dog, it could be as much as $180. Here’s what I was up against with Leroy. First off, he’s a big dog. He ate the battery on a holiday, so I was already in for an “emergency call” fee of $200 right off the bat. Then, he was rambunctious, and didn’t want to be x-rayed, so the vet had to sedate him. That was another $100. Then, the first set of films didn’t come out just right, but it wasn’t the vet’s fault, so another $100. By the time I got Leroy home, what with the x-ray fees, the emergency fees and everything else, I was out about $1,000 – not that I cared. Leroy was okay, and that’s all I really cared about. A canine x-ray is, indisputably, expensive. According to Stephen, my vet, that’s because canine x-rays and human x-rays are a bit different. X-ray machines, apparently, operate on different settings. A lower setting is used for human x-rays, because humans typically have bodies that are less dense than those of dogs. Dog bodies are denser, so the setting has to be higher, and that means that the canine x-ray could be less reliable. 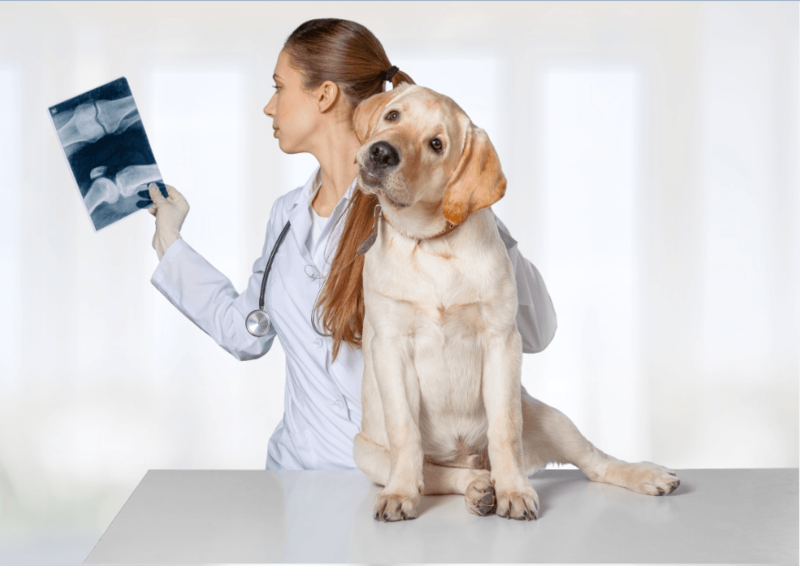 Canine x-rays being not overly reliable, your vet might choose to go with another method that allows for better focusing on the area that needs to be treated. One of these methods is ultrasound. Usually, ultrasound imaging isn’t used to diagnose broken bones, the way a canine x-ray would be used. The ultrasound is used to detect ailments, usually in the abdomen. Another type of imaging that your vet might use is CT scanning. This delivers an image of the cross-section of the body part that needs to be imaged, and is usually employed to identify issues in the head, chest, and some joints. MRIs might also be used. This is a means of using a magnetic field in conjunction with radio waves to identify anomalies in body tissue. It is often used to diagnose issues in the spinal cord or the brain. Damn the cost! If your dog is not feeling well, and an x-ray will help to determine what is wrong, pay the fee! If you think you have been overcharged, work it out later with your vet, but, in the meantime, get your dog the treatment that he needs. Don’t waste time if you think you have an emergency. A canine x-ray, as previously stated, can cost you anywhere from $40 to $180. Other imaging can range anywhere from $300 to $500. What price are you going to put on your dog’s life? No one wants to end up hugely out of pocket when it comes to vet bills, but when it means the difference between your dog living or dying, open up your wallet and live with the cost. Canine x-rays are costly, yes. So are other imaging treatments. But how would you feel if you said “I’d really rather not pay for the x-rays; let’s just see how things play out,” and your dog dies? Can you live with that? I know I couldn’t. The cost of canine x-rays, when weighed against the huge emotional cost of losing your dog, is negligible. If your dog needs x-rays, pay for them. That’s all I have to say.